While researching a story a couple of weeks back, I interviewed an expert who advises hotels on how best to use social media. He told me that some clients were starting to realize that social media is here to stay, and that they had better start making good use of it. It’s tempting to think about social media in the short term, since it’s a relatively new phenomenon. Indeed, new services seem arrive quickly and sometimes fall out of favor. MySpace, for example, was once commanding international headlines, but its popularity has fallen off sharply. In June, comScore pointed out that in 2007, people spent one out of every 12 minutes online interacting with social media sites. That figure is now at one out of every six minutes. And a June study from the Pew Internet and American Life project reported that 47 percent of adults in the U.S. say they use a social networking site. That’s up from 26 percent in 2008. Yes, there are important questions to ask here, like whether or not social media is actually beneficial for its users. This is a topic for another blog post, perhaps. For now, I wanted to share the following sketches to illustrate how my thinking about the way I interact with the Web has changed over the years. Warning: The following is very geeky. These scribblings will not win any drawing awards. As you’ll see, I labeled this “My Social Media Ecosystem,” and I drew a line in the left corner separating my “public” and “private” spheres. In the upper left corner, I listed three online communities with which I was once involved but no longer use. These include Mixx.com, which was a site that allowed users to set up pages and bulletin boards to share information on various topics; GoodReads, the well-known book-centered community; The Glove Bag, a community for soccer goalkeepers; and Emory Alumni, my alma mater’s community site. 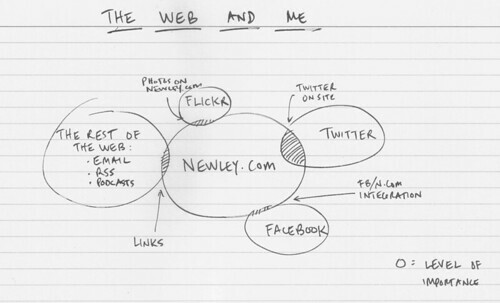 In the middle of the diagram is my site, Newley.com, which you’re reading now. Overlapping the upper left and right corners are my Flickr page on the popular photo sharing site, and my Twitter account. I also drew a link between my blog and my personal Facebook account. In addition, I created a line between my site and my “blogroll,” which was once a long list of sites I linked to but is now a more focused list on my links page. I also placed question marks around three social sites I was thinking about using but never embraced: FriendFeed (RSS/feed aggregation), Tumblr (microblogging), and Vimeo (video). And finally, I listed the ways I collect input on the Web: through RSS, email, podcast, and Twitter feeds. All in all, it is a somewhat jumbled diagram. Here, I charted my “level of engagement” along the “y” axis, with levels of public or private networks listed on the “x” axis. Newley.com is in the upper left, as I regarded it as the Web entity with which I am most involved. I still feel that way. Similarly public, but with less interaction on my part, are the blogs that I read and the Flickr users I track. I estimated Twitter as being equal in terms of level of engagement as my blog, but it’s further along the “x” axis. 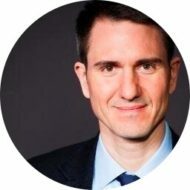 While my Twitter feed is just as public as Newley.com, it’s slightly more closed in that users must sign up with the site to participate in discussions. I listed Facebook as more private but involving less of my personal engagement. This is curious, since Facebook, of course, centers on personal relationships. But I consider my activity on that site as being less important than here, on my public Web site. Skype shows up on this diagram as being private but involving less engagement, as I use the service not only for calls and video, but also for instant messaging. And finally, I’ve listed podcasts here, though I’m not sure that they constitute social media. I have a high degree of engagement with the podcasts I listen to, but there’s no back-and-forth interaction, so the format feels largely broadcast in nature. In retrospect, this diagram doesn’t seem especially meaningful, since levels of engagement and public or private measurements, as charted on the axes, aren’t valuable metrics. I’ve used a venn diagram format here, with my site occupying the most prominent spot, in the middle. Flickr overlaps a bit, as I occasionally host blog images (like these diagrams) there. Twitter has a larger overlapping section, since I frequently post observations and links there throughout the day. And my Tweets have a more prominent place on Newley.com, since they can be seen on the right side of every page. Facebook has a Flickr-sized overlapping segment, since I have a box on Newley.com inviting people to “like” my newly created public Facebook page. And finally, on the left, you’ll see a circle for what I call “The Rest of the Web”: email, RSS, and podcasts. This diagram feels the most natural to me, which shouldn’t be surprising since it’s the freshest. My personal site is at the center of my engagement with the Web. Indeed, I registered Newley.com in 1999 and have been blogging consistently since 2002. I think of Newley.com as hub of my online presence. This site contains links to my work, my contact information, and my ongoing posts about the things that interest me. I suspect that this will continue to be the case in the years ahead. Social media sites may rise and fall in popularity, but I have continued using Facebook, Twitter, and Flickr. I see no reason that this should change. Will I start using the much-discussed Google Plus? I’m not sure. One service that is missing in every diagram is social bookmarking. I used to make ample use of delicious.com, but I never used it socially. I don’t see bookmarking as an inherently social service. If I want to share a link with others, I do so on Twitter, Facebook, or here. 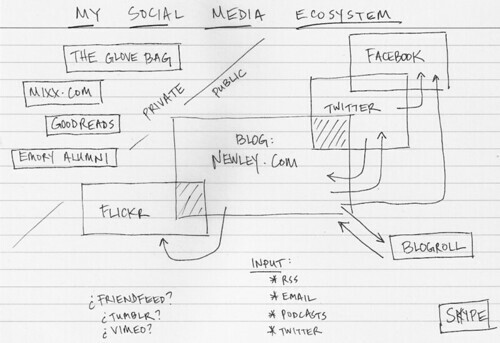 In my last diagram, I make no distinction between public, private, and various levels of engagement. I now think of my involvement with the Web simply in terms of overlapping services, with my own site in the middle. This may be a function of my evolving comfort with social media. Perhaps I’m not as concerned now with how “engaged” I am with a particular site, or whether or not it’s public or private. I have come to understand these factors and don’t dwell on them. Looking ahead: If, as the expert told me, social media is here to say, what might these sketches look like in five or ten years? Or in 20 or 30 years? Interesting to see how you interact with the web diagrammed out. 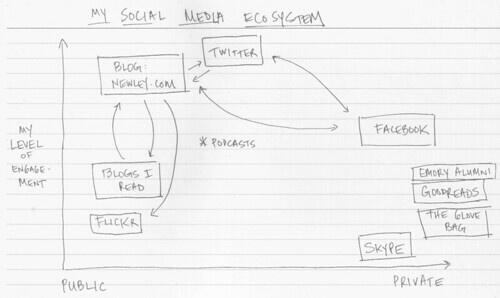 If each platform (blog, fb, etc) were drawn to scale each year according to not the level of personal importance or activity, but according to engagement how would your diagrams look? For me personally the first year would show Facebook taking up most of the space and Twitter in the later years matching it in size and then becoming larger. I’m guessing you’re correct in that a few of the big players would stay the same. I expect their to be more and more integration between the sites or more third parties offering one stop social sites. Interesting point, Dwight. That would be a great way to design these in the future: simply in terms of engagement, not personal importance. In some ways, perhaps I’m less engaged with my blog than I am with Twitter or Facebook. But my site is more important to me. I’ll keep that in mind for any future drawings. And yes, I can definitely imagine more integration between social sites in the future. Great article. I think my diagrams have fluctuated massively in the last 5 years. When I lived in Bangkok around 2006 – 2008, I mainly searched the net for writing work and tv work. Otherwise it was just emails home. I hadn’t even signed onto facebook then. The chart would have been entirely private. I met you (Newly) at Greg or Jon’s house and was inspired to start a website. I also met Stuart once coincidently and wrote something for travelfish (Asok to Ekkamia intro I think) and was similarly inspired. I now have two sites that have rocketed to the top of my theoretical diagram. I now have twitter and facebook. I also now trade shares online which is suddenly a massive amount of time. So it has been private to public for me. So I think you should do an even geekier animation next time showing fluctuations. Or not. It will be needlessly time consuming. Hi by the way. Really interesting stuff. Makes me wonder what my charts would like like. One immediate thing that jumps out and perhaps skews it is the importance of your blog as a central focus of the entire shebang — many (if not most) people on say FB prob don’t have a blog to take centre stage, so FB becomes it — and that is the piece of action Google is chasing with G+. Myspace -> Friendster -> Facebook -> what’s next? Good point, Stuart. Indeed, I’m sure such diagrams would look a lot different for folks without stand-alone sites. Do you think of Travelfish as being in the center of your Web universe, or is that work-only, with Twitter or another presence your main site?